Today ustream.tv got a makeover (which hopefully will solve the problems with the crashing many people have been experiencing). 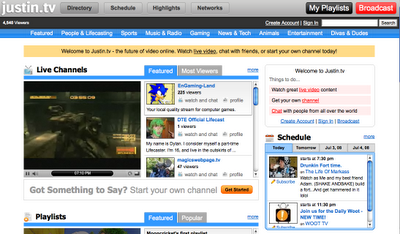 Although the site looks nice I can't help but notice the extreme similarity to another popular live streaming site. Yes, that would be justin.tv. For a little over a year now these two sites have been in a streaming battle! Each have taken ideas from the other to improve their sites (not to mention streamers). Both basically have the same features now. So whats differentiating them from each other and other streaming sites? You tell me! Feed Back is a must on this story! Take a look at the screen shots for yourself. Well since you left justin.tv and came over to ustream.tv, the best channel is on ustream. Wow. They really look the same now! I didnt notice it until I read your blog!! I would say though since Ustream has your show and TNT they are way better than Justin.tv . Ustream layout = fail just like Mississippi LULZ! I don't know if everyone is seeing the real issue. Ustream is not separating themselves out from the competition anymore. Having a almost cookie cutter look of a competitor site is a bad idea. Ustream has to come up with something to separate themselves. Originally their homepage had a unique look. Many of the features were the same but ustream was still different. At this point ustream needs to break out of the shell. Although I am not a fan of plurk I do give them a lot of credit because they have a similar service to twitter but tried to make it original by using a different form for their time line. It may not be as effective (and should be changed) but it does separate themselves out enough from twitter. Ellie perhaps with the two services getting so much similar to each other, we're seeing a possible joining of the two websites. One taking the other over. See I do not see JTV and ustream merging. 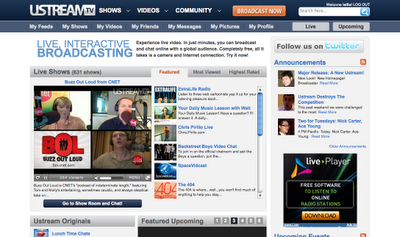 If Ustream were to merge with anyone I would think it would be blogtv.